The most beautiful ceramic craftworks of Ecuador are being made by Canelos Quichua women dwelling in the Oriente region. Women there not only give the shape to the final piece but also go to the forests in quest of maga alpa, the special clay that is needed to make different types of pottery from the selva of Ecuador. It is believed that they have to invoke the power of forest dwelling goddess, Nungwi, to get the necessary help for their work. Once they invoke the power of the goddess and find the clay, they bring back home the ceramic raw material in special bags known as shigra purses. Depending on the type of maga alpa obtained, the Indian women decide the item that will be manufactured with it. The design of the pots or vessels made from this clay also changes depending on the purpose for which it is made. As the design, shape and other variables to the making of the pots are determined women need to tear a piece of hair and use it in the paint brush for creating the ceramic folk art. Women practicing ceramic craftworks respect the gods and spirits of the jungle. They take special care when they make any vessel needed for ritual purposes. Chicha jugs, which are mostly used for ritual purposes are designed with the symbolism of each shape in mind. Stars, plants and different types of animals are designed on their vessels as they consider these to be potent spirits. The geometrical shapes, which are engraved or painted on the vessels also have a strong relevance with the power animals of the tribe. The ceramic works of the tribes are not only inspired by their religious beliefs but also from their dreams as the Canelos Quichua believe the world to be an imitation and dreams to be the reality. Though the ceramic selva items are manufactured in the jungle areas, you don’t have to go to the Amazon region to find this beautiful ceramics. 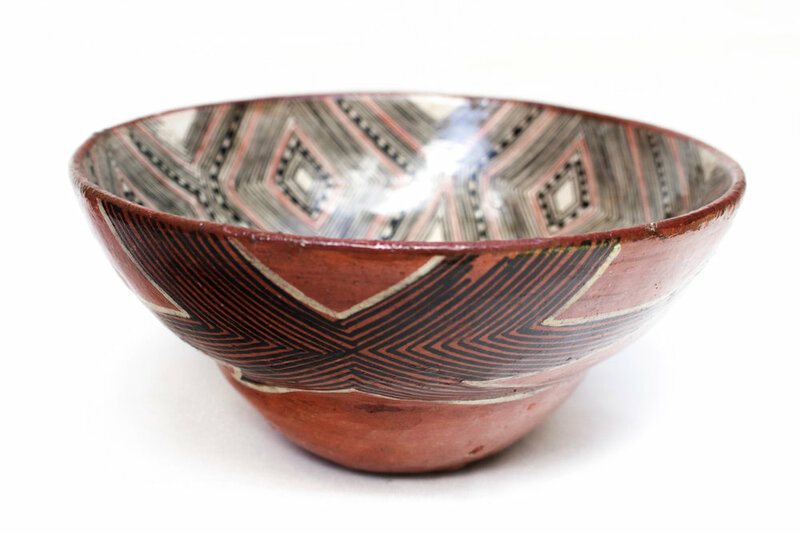 Visit our store to find a huge collection of carefully select ceramic from the native people living in the Oriente region of Ecuador. Eduardo is a master at his craft. to him, working with clay comes so naturally. At age 75 Segovia shows no signs of slowing down, ceramics are not only his profession but also his passion. His home is filled with galleries of his work from his signature piece like "la chola" to more fantastical, colourful ceramics like the ones we offer at Galeria Latina. No two pieces are alike. Like most artists Segovia is inspired by his surroundings. Eduardo is from the beautiful and colonial city of Cuenca, Ecuador's capital of art. There is gathers inspiration from other artists as well as landscapes, wildlife and Cuenca's culture. Additionally, Segovia has an imagination that he harnesses to created surreal ceramics. When we asked where these came from, his answer: "my dreams, I wake up an instantly start working on figures I see when I'm asleep."